Chef Pamela Cager grew up in a culinary environment. Her grandfather was a chef for Wake Forrest University. As a child, she watched her mother create baking masterpieces from scratch. Her mother introduced her to the culinary world at age 9. It was that summer that she won her first Blue Ribbon from the Dixie Classic Fair and she says she was hooked! 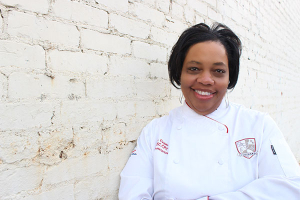 In 2012 Chef Pam graduated from Guilford Technical Community College with an Associate Degree in Culinary Technology. While there, she received her Certification from the American Culinary Federation (ACF) as a Certified Chef as well as a Certified Pastry Chef. Chef Pam resides in Winston Salem and is the Owner/Operator of For All Occasions Catering.